I brought you home during a bad time. I just didn’t have the space to build you up the way it needed. Unfortunately, you had to sit around for awhile before I could get to the build. Once I got my workshop cleared up enough, though, I got started. 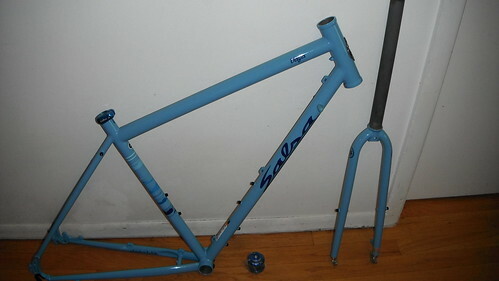 Here it was when I first got it assembled. Basically just transferred over the parts from the Pompetamine, with new Midge bars, Retroshift CX1v levers and a 1×10 geared drivetrain. The retroshift levers are basically just the same Tektro brake levers I’ve been using, except with a Microshift indexed thumbshifter mounted on the front. The only part Retroshift actually MAKES is the little red ano cable stop seen here. So far, I like the levers. The shifter just works, and was a helluva lot cheaper than SRAM or Shimano integrated shifters. And, I didn’t have to buy a left-side lever with shifty bits I wasn’t going to use so I could get the same lever feel in both hands. 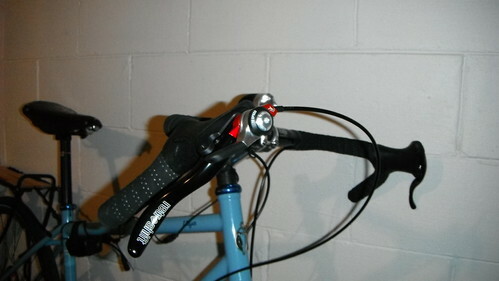 These levers are designed to work with long pull brakes, but Retroshift sells a version for short pull, too. 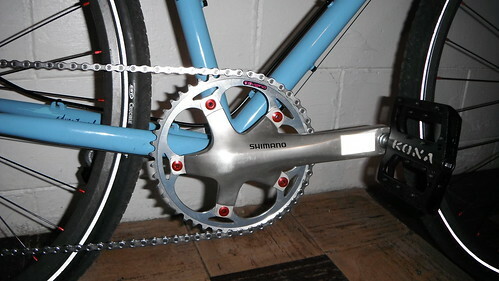 To further flesh out details of the drivetrain, I used the same crankset and chainring I was using on the Pompetamine. I’ve got some Kona Wah-Wah pedals on now that I won in the Brown County Breakdown raffle. 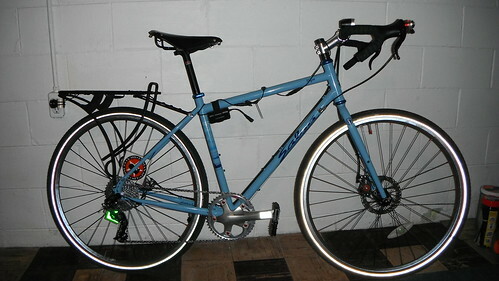 I’ve gone with a 1×10 drivetrain here to give me some gearing options, but still keeping it simple. I’m using a 9spd SLX rear derailleur, a 10spd 11-36 Shimano XT cassette, and a 10spd XT chain. 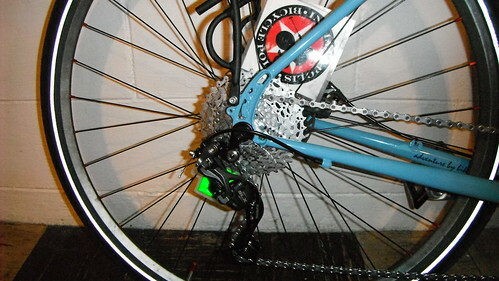 Yes, a 9spd mtn derailleur works with 10spd road shifters and a 10spd cassette. The available gearing here is pretty darned close to what you’d get from a road compact double. I don’t care much about the high end of the range at all, since this bike runs fatter tires and weighs more than most bikes that would get a compact double. At the low end, the gearing works fine now. If I ever wanted to ride to Brown County, I’d probably put a smaller chainring so I could have more low end gearing for the hills. 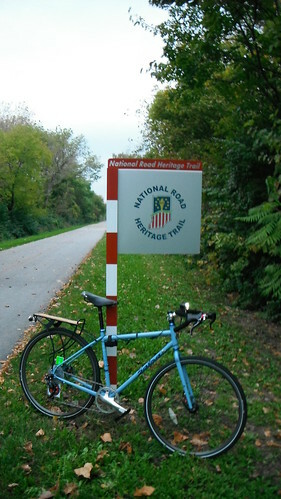 Here’s a shot on the Pennsy Trail on its maiden test ride. It rode well, but I had to make some adjustments to the handlebars. After that ride, I managed to drop the handlebars, and rotate them some to make the drops more useable by moving the levers some. I also managed to get my old fenders to install, and get some 700×38 Specialized Crossroads tires to fit inside there with some tweaks. I think the bike looks better with bigger tires. It should ride better, too. 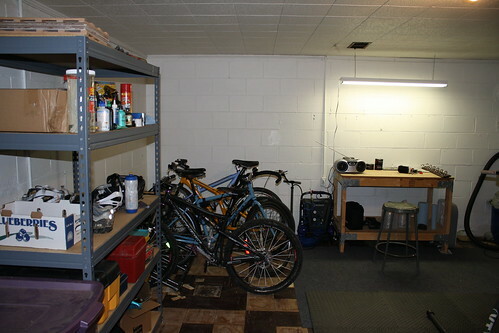 The workshop is coming together. 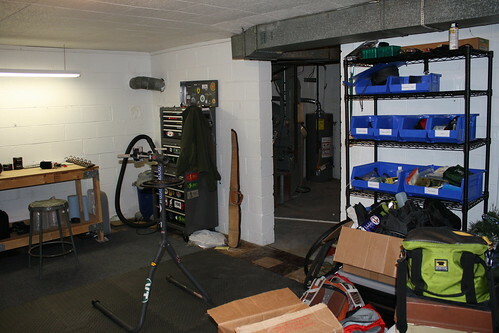 I still need to work on it…I need more storage for gear (namely, a rack to hang packs and sleeping bags), and I need a pegboard and maybe more workbench space. 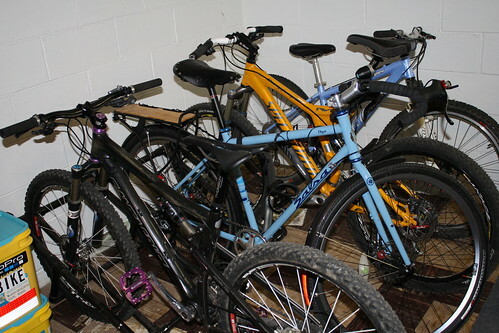 The bike storage works well. It could probably take up less space, though. I’d rather not drill a bunch of holes in the concrete block walls, though. I had to put holes in the block walls in the garage for the canoe rack, and I dulled up a couple expensive masonry bits in the process. They are On-One Midge bars. In general, I like them, but my hands are too big to make use of the drop position, no matter how I move things around. I’m replacing them this week with some Salsa Cowchipper bars. Those are a similar idea, but with more length in the drop position so that’s a bit more useful for headwinds and such. Yeah i got the Salsa woodchippers and i love em. Just like the look of these. Good tip though on not being enough space on the drops….I hate that. Salsa bars give you plenty of room to move around. Next Next post: Snow Ride! Freezing!